The word Sybil comes (via Latin) from the ancient Greek word sibylla, meaning prophetess. The Erythraean Sybil was the prophetess of classical antiquity presiding over the Apollonian oracle at Erythrae, a town in Ionia opposite Chios, which was built by Neleus, the son of Codrus. 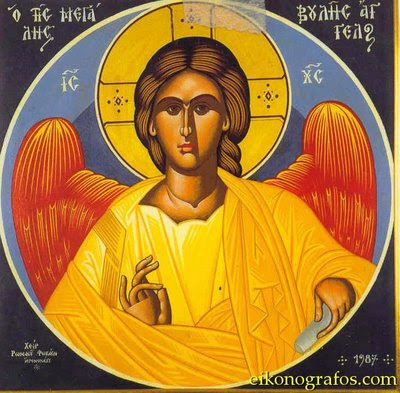 Many Church Fathers believed that she prophesied the coming of Christ through the acrostic ΙΗΣΟΥΣ ΧΡΕΙΣΤΟΣ ΘΕΟΥ ΥΙΟΣ ΣΩΤΗΡ ΣΤΑΥΡΟΣ or JESUS CHRIST GOD SON SAVIOR CROSS. The translation below of the Oration of Constantine from the 4th century is poetically formed to fit the original, but the original Greek can be read here and a more literal translation here. My desire, however, is to derive even from foreign sources a testimony to the Divine nature of Christ. For on such testimony it is evident that even those who blaspheme his name must acknowledge that he is God, and the Son of God if indeed they will accredit the words of those whose sentiments coincided with their own. 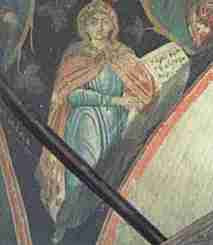 The Erythræan Sybil, then, who herself assures us that she lived in the sixth generation after the flood, was a priestess of Apollo, who wore the sacred fillet in imitation of the God she served, who guarded also the tripod encompassed with the serpent's folds, and returned prophetic answers to those who approached her shrine; having been devoted by the folly of her parents to this service, a service productive of nothing good or noble, but only of indecent fury, such as we find recorded in the case of Daphne. On one occasion, however, having rushed into the sanctuary of her vain superstition, she became really filled with inspiration from above, and declared in prophetic verses the future purposes of God; plainly indicating the advent of Jesus by the initial letters of these verses, forming an acrostic in these words: Jesus Christ, Son of God, Saviour, Cross. Crowned with his saints, in human form appear. Riches, and pomp, and man's idolatry! No refuge then, but hopeless agony. On ocean's plain no more shall navies ride. Shall soothe, no fountain slake the parched ground. Voice of wrath long delayed, revealed at last. On judgment's seat earth's kings their God shall own. Radiant with light, behold Salvation's Sign! O'er every land extends his iron sway. Saviour, eternal king, who bears our sins away. It is evident that the virgin uttered these verses under the influence of Divine inspiration. And I cannot but esteem her blessed, whom the Saviour thus selected to unfold his gracious purpose towards us. Source: Oration of Emperor Constantine to the Assembly of the Saints, Chs. 18 and 19.